After only one National Collegiate Hockey Conference (NCHC) team swept last weekend, Denver earned three Bauer NCHC Player of the Week honors for Jan. 4-10 while Colorado College earned the fourth accolade on Monday. Claiming Bauer NCHC Players of the Week for week 12 are Denver sophomore forward Danton Heinen for Offensive Player of the Week, DU junior blueliner Will Butcher for Defenseman of the Week, Denver freshman forward Dylan Gambrell for Rookie of the Week and Colorado College freshman netminder Jacob Nehama for Goaltender of the Week. Heinen captured his first NCHC honor of the season and sixth of his career on Monday, including his second career Offensive Player of the Week accolade after earning Rookie of the Week four times last season. Butcher garnered NCHC Defenseman of the Week for the third time this season and fourth time in his career, while Gambrell received Rookie of the Week for the second straight week. For Nehama, the honor is the second of his NCHC career but first Goaltender of the Week after earning Rookie of the Week earlier this season. Heinen (pictured) led the Pioneers to a sweep at No. 6 Omaha with a three-point weekend, handing UNO its first two home losses of the season. 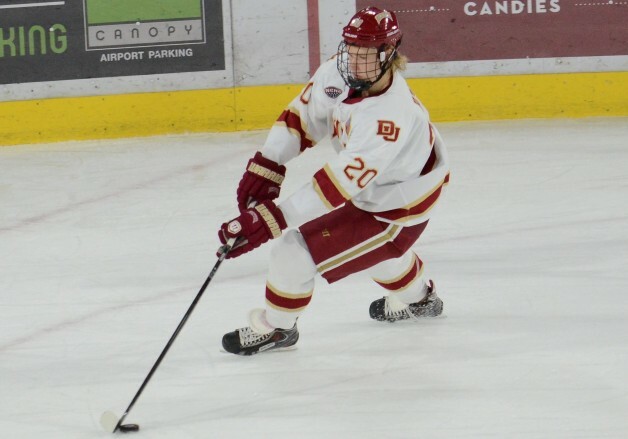 On Friday, the Boston Bruins draft pick assisted on DU’s second goal, which came early in the first period in a 3-0 win, while he posted a plus-1 rating and put two shots on goal. A night later, Heinen logged his third multi-point game of the season as he scored the Pioneers’ third goal to make it 3-0 while he assisted on the game-winning goal later in the third period, which came on the power play. He put two more shots on goal and was named the game’s third star in Saturday’s 4-3 win. Heinen finished the weekend with a goal, two assists and four shots on goal while posting an even plus/minus rating. Butcher was productive at both ends of the ice in Denver’s sweep at No. 6 Omaha, scoring a pair of goals while helping limit the Mavericks to three goals all weekend and playing on a penalty kill unit that was successful at a 90.9 percent clip in the series. On Friday, Butcher book-ended the Pioneers goals in a 3-0 shutout of UNO for his first collegiate multi-goal game. He opened the game’s scoring less than four minutes into the game, which turned out to be the game-winner, while he added another goal in the second stanza to cap DU’s scoring. The Colorado Avalanche prospect also blocked four shots, posted a plus-2 rating and led a penalty kill that went 6-for-6 Friday, as he was named second star of the game. The following night, Butcher again logged a plus-2 rating while blocking two more shots and helping limit Omaha to only 28 shots on goal in a 4-3 victory. Butcher ended the weekend with two goals, a plus-4 rating, six blocked shots, four shots on goal and anchored a penalty kill unit that was 10-for-11 on the weekend. Gambrell earned his second straight NCHC Rookie of the Week honor after racking up four points in a sweep at No. 6 Omaha. In Friday’s 3-0 shutout, he handed out the primary assist on DU’s second goal early in the first period while posting a plus-1 rating. The next night, Gambrell tied a career high with three points on a goal and two assists as he was named the game’s first star. He had the lone assist on Denver’s opening goal of the game while he also set up DU’s third goal and then scored the game-winning goal on the power play in the third period to put the Pioneers ahead 4-2 in an eventual 4-3 win. With points in both games, he extended his point streak to a career-long-tying four games. Gambrell finished the week with a goal, three assists, a plus-1 rating and four shots on goal, while also blocking three shots and winning 9-of-18 faceoffs in the series. Nehama had a monster weekend in backstopping the Tigers to a split at No. 4/5 St. Cloud State. He posted a .953 save percentage on the weekend while going 1-1 in net and making 81 saves on 85 shots against. In Friday’s 2-1 loss, Nehama surrendered two goals in the first period, but did not allow another one over the final 47:53 of the game as he totaled 34 saves, including eight saves during SCSU’s five power plays as he helped kill all five. A night later Nehama was even better, racking up 47 saves, the second-most of his career, in a 5-2 victory, as he was chosen the game’s first star in CC’s first conference road win of the season. He turned aside 19 shots in the third period alone to preserve the win as the Tigers turned up the pressure, while he made nine saves on four Husky power plays, killing three of them. Nehama finished the series with a 2.02 goals-against average after SCSU entered the weekend leading the NCAA with 4.50 goals per game, while he led a CC penalty kill that went 8-for-9 against the second-best power play in the NCAA, stopping 17 of 18 shots on St. Cloud State’s man advantages.